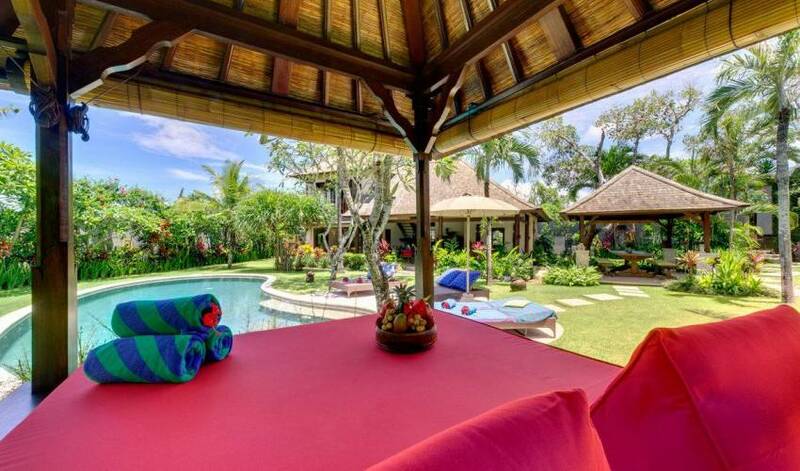 Villa Kakatua offers a blissful retreat just metres from Batu Bolong surf beach in Canggu on Bali’s south-west coast. 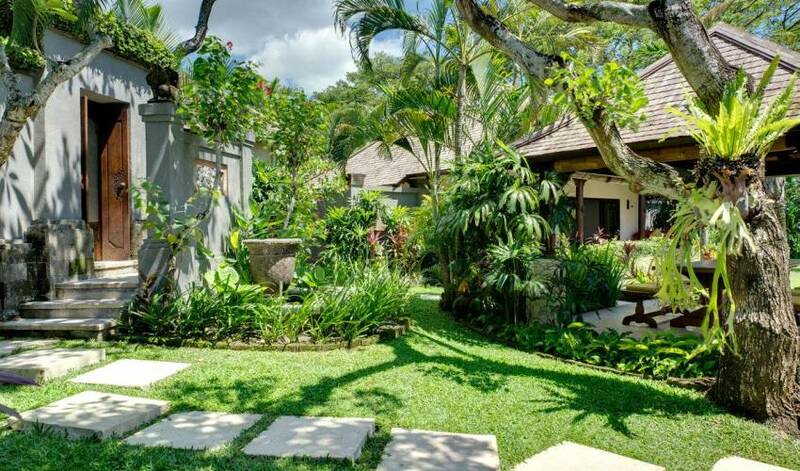 Hidden behind private walls and resting amongst lush tropical gardens, this four-bedroom villa is perfect for families and groups seeking a traditional Bali-style getaway within easy walking distance of some of the island’s hippest, healthiest, happening hang-outs. 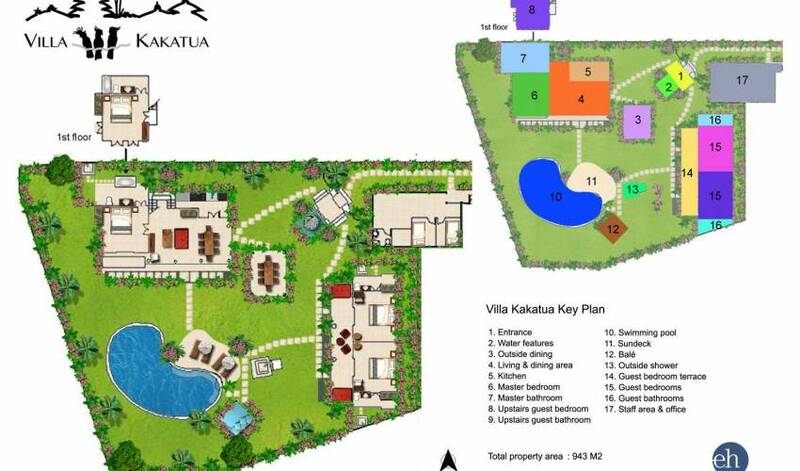 Larger groups can book the villa together with neighbouring three-bedroom Villa Kedidi for a seven-bedroom option. 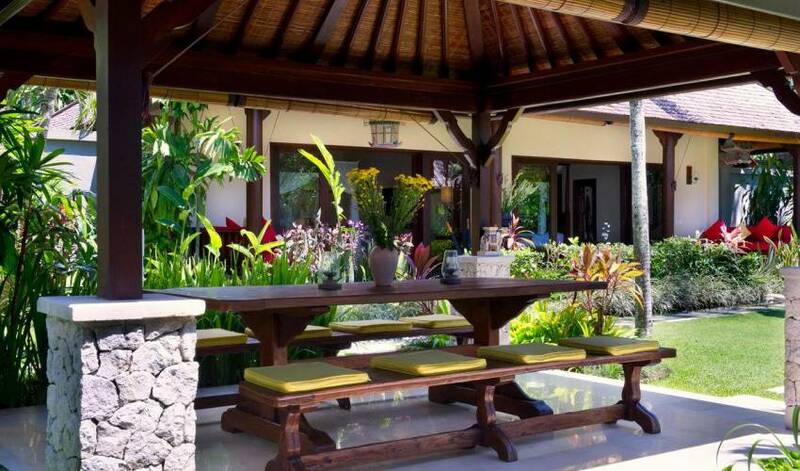 Child friendly and with warm and attentive staff, guests will find it hard not to relax and unwind in this beautiful Balinese home-away-from-home. Whether it’s lazing by the pool, taking a stroll through the rice fields or catching a wave at one of Canggu’s popular surf breaks it won’t take long to succumb to the infectious island spirit. 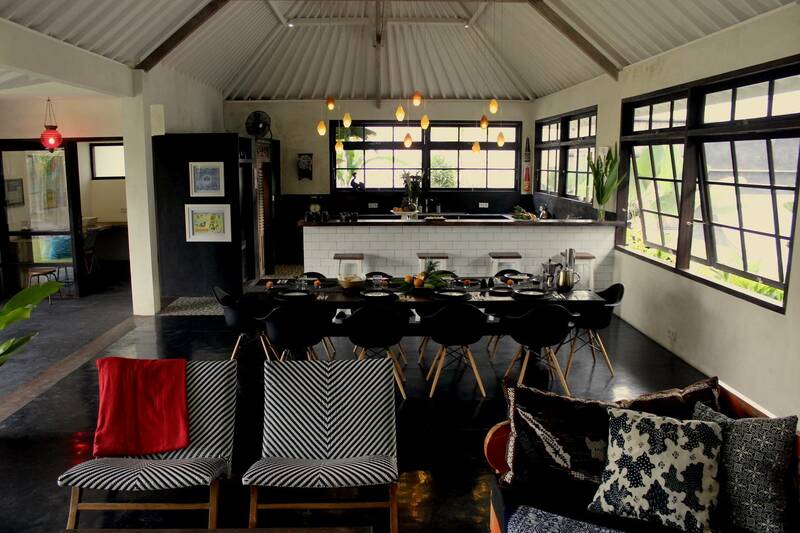 Kakatua (which means cockatoo) is a gem of a villa for families and friends seeking a relaxed and comfortable holiday at an affordable price. 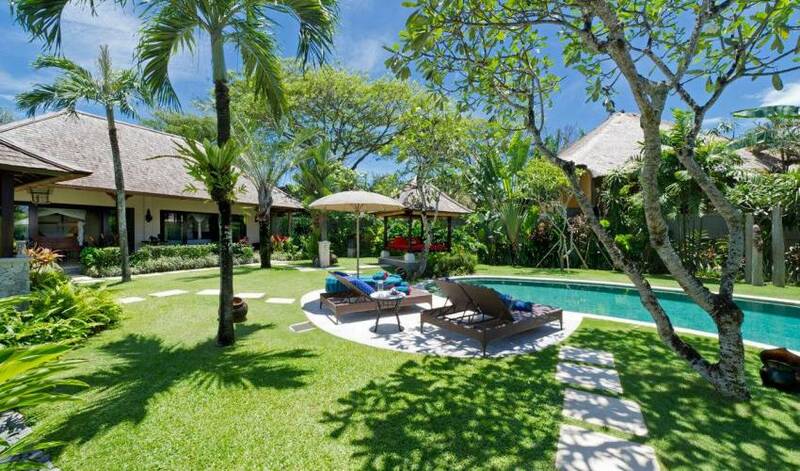 Located next to its sister, three-bedroom Villa Kedidi, this four-bedroom villa is the epitome of simple luxury. 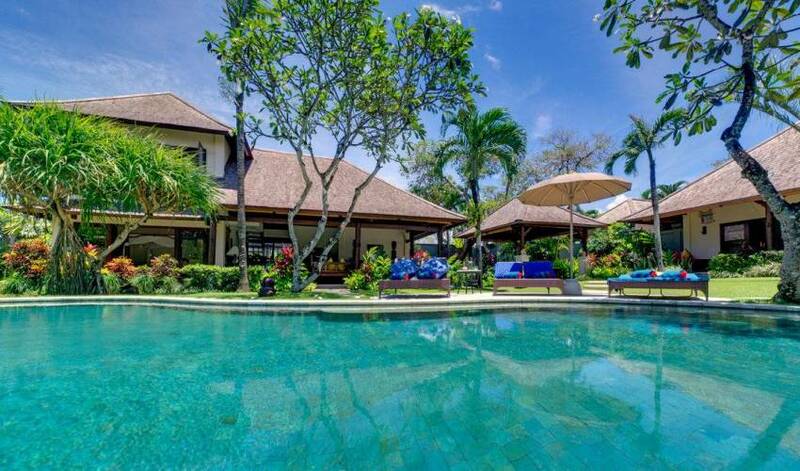 Beautifully designed in classic Balinese style the villa features timber pillars and high serapwood ceilings, garden bathrooms, traditional artefacts, a free-form swimming pool and lush tropical surrounds, home to a myriad of exotic plants and birdlife (you may even see a cockatoo). 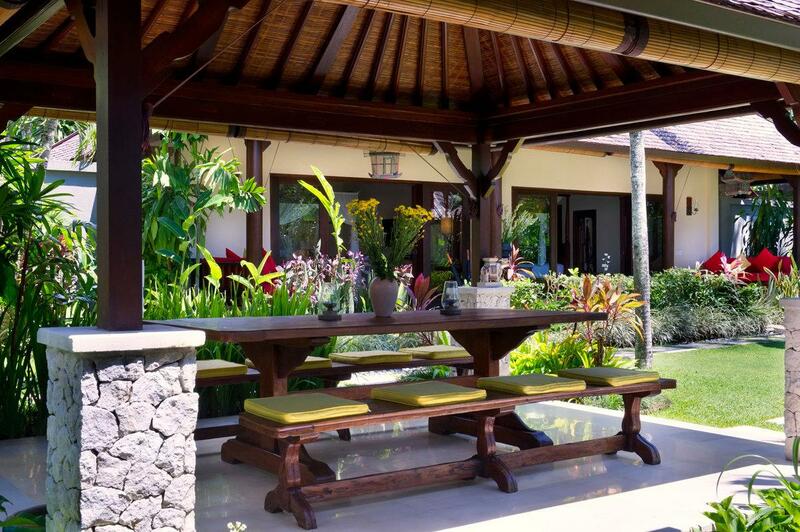 Just 100 metres from the beautiful black volcanic sands of Batu Bolong Beach, the villa is perfectly placed for exploring Canggu’s cool cafés, innovative restaurants and chic boutiques, yet retire to their own quiet little slice of paradise at the end of each day. Catch a wave, build a sandcastle or be mesmerised by the setting sun – you will soon feel the peace and tranquility that this Island of the Gods is famous for. 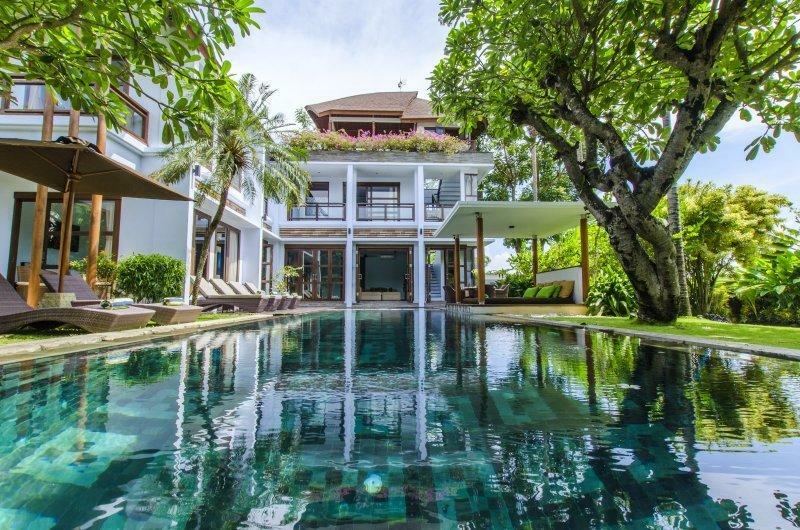 This family friendly villa has everything you need, from high chairs, baby cots and toddler-safe cutlery to pool toys, kids movies and lots of lawn for letting loose. The warm and hospitable staff are excellent with children and the in-house chefs are well-equipped to cater for the fussiest of eaters. And knowing that the family is well cared for gives adults more time to relax. 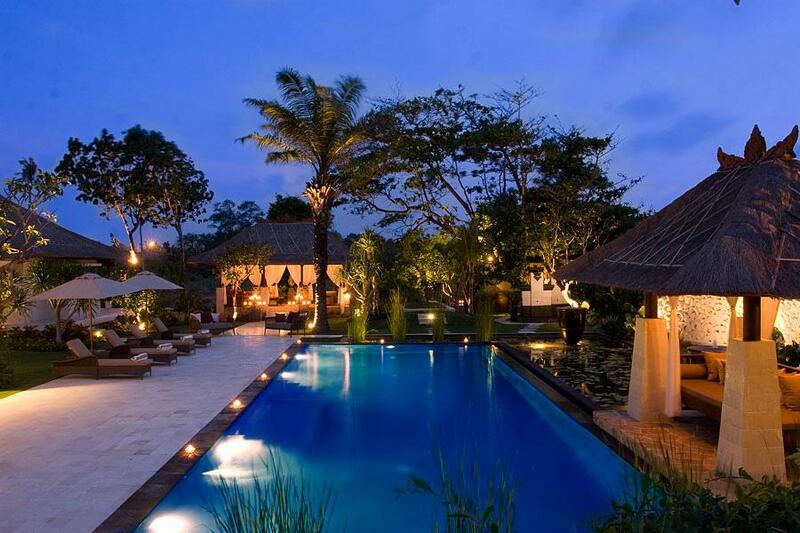 Chill out in the poolside balé, pamper yourself with a spa treatment or enjoy a sunset cocktail at the five-star Hotel Tugu next door – the list is endless. 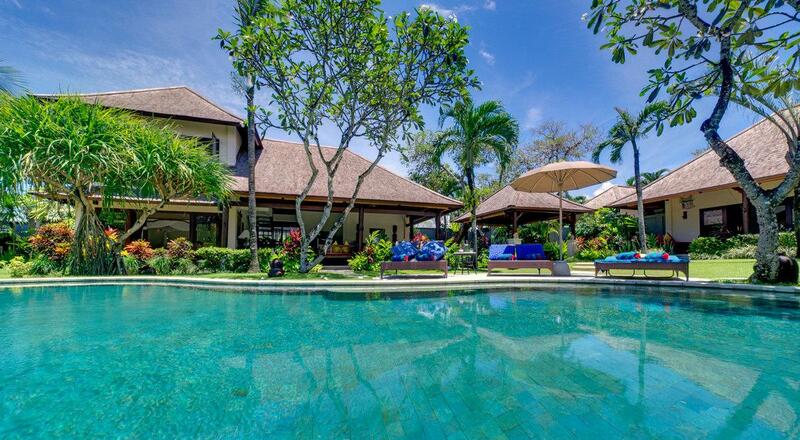 A true home-away-from-home, the villa will embrace you with its character and charm. It’s no surprise that guests are eager to return year after year. 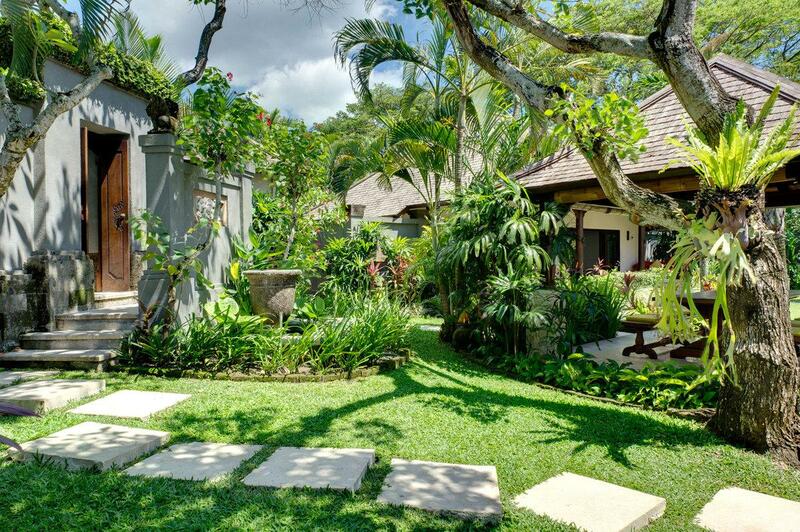 A private path bordered by plants and limestone carvings leads to the villa’s traditional Balinese doors. Behind these doors guests are greeted by an aling-aling wall (a short partition wall which, according to traditional belief, protects the villa from bad spirits), a fishpond and a bubbling water feature. The main two-storey pavilion houses the master suite, one guest bedroom, the living area and the kitchen. Adjacent to this is the dining balé, and to the far side of that the other two guest bedrooms lie side by side below a thatched roof. 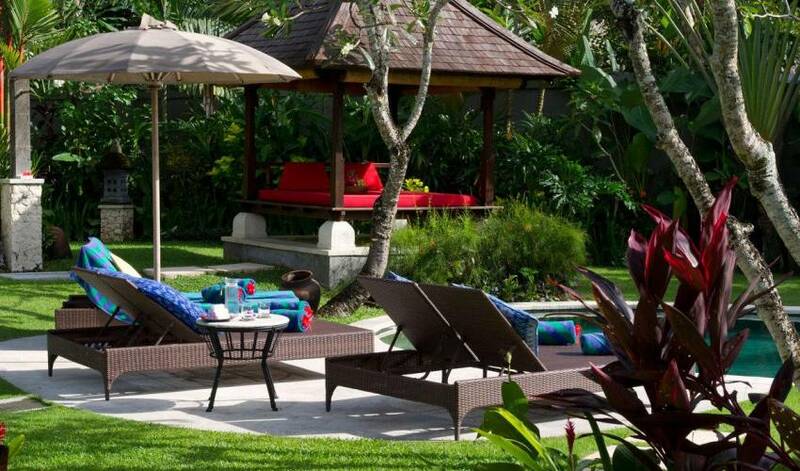 Each room faces the lagoon-style pool and lush gardens enabling guests to enjoy the peace and tranquillity from every angle, while those wishing to embrace the spiritual side of Bali can observe daily offerings being made to the gods at the villa’s very own garden temple. Overlooking the pool, the villa’s open-sided living area is a great place to unwind or watch a movie under the cooling breeze of the ceiling fans. 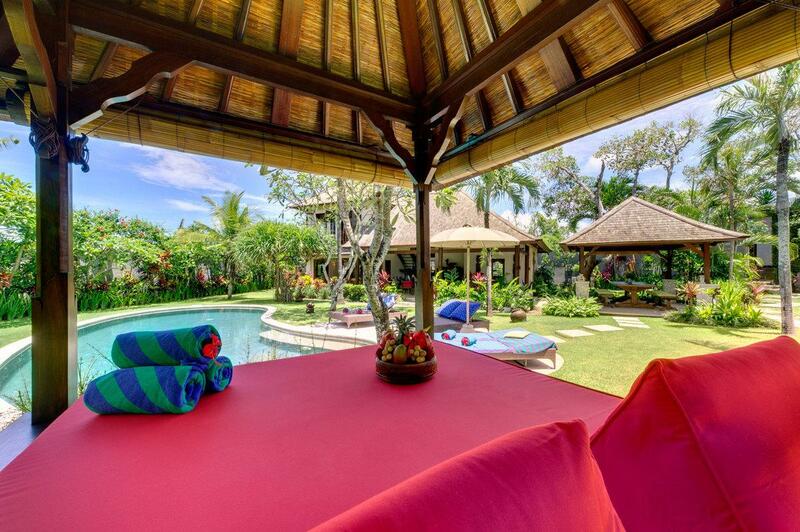 Decorated with an array of Indonesian artefacts and antiques this room evokes vivid images of ‘old’ Bali. Two comfortable red sofas, topped with bright yellow and blue cushions face a carved wooden coffee table at one side of the pavilion, while a table and chairs at the other provides enough seating for four to enjoy breakfast or an afternoon snack – or perhaps a board game. Two beautifully carved Balinese dancers pose on either side of the kitchen doors at the rear of the living room. The modern kitchen comes with stainless steel appliances and all essential childrens equipment. Standing close to the living pavilion and fringed by lush vegetation, the thatched dining balé with its solid wood table and two large bench seats provides the perfect setting for a casual dining experience. At the heart of the villa lies the lagoon-style salt-water swimming pool surrounded by manicured lawns and lushly landscaped gardens. Every tropical plant you can think of is on display here, from flowering frangipanis to impressive fan palms and clinging stag-horn ferns. The delightful poolside balé is the ideal place to soak up the atmosphere or indulge in a massage or spa treatment. 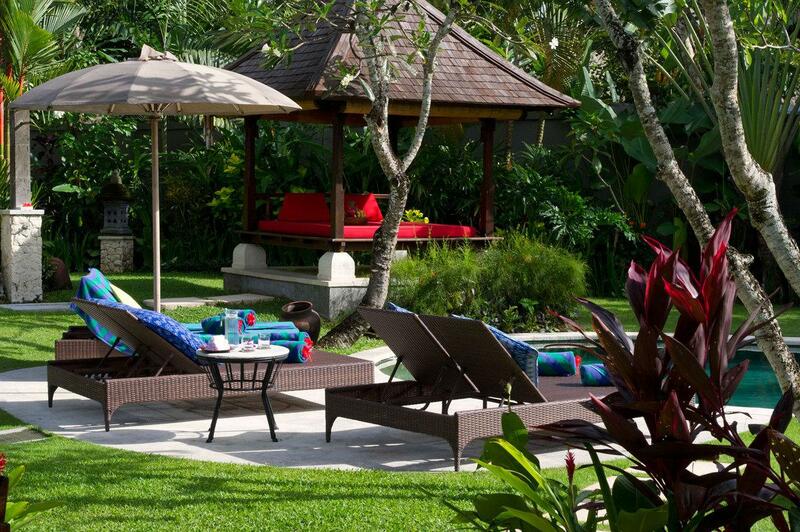 If a suntan is your goal, then stretch out on one of the poolside loungers, order an ice-cold drink, relax and enjoy. All four of Villa Kakatua’s air-conditioned bedrooms are similar in design with polished cream terrazzo floors, ceiling fans, beautifully carved wooden beds draped with mosquito nets and antique batik throws. Tastefully decorated with Javanese antiques and traditional paintings and portraits, the rooms are very homely and comfortable. iPod docks in all bedrooms and TV/DVD players (in all but bedroom four) add a modern touch, while the lovely garden bathrooms, dotted with bluestone pebbles and with open-air showers, inject tropical style. The ground floor master suite (with the additional luxury of a tub in its bathroom) lies immediately off the main living area, with glass sliding doors opening onto the pool. The upstairs guest bedroom has great views over the gardens and is accessed by a wooden staircase from the living room. Bedrooms three and four are tucked away in their own pavilion with a shared veranda for cheeky daytime naps on the comfortable bright red daybeds. One of these rooms features a giant four-poster bed large enough to sleep four children (2 of which may incur extra cost) or two adults. 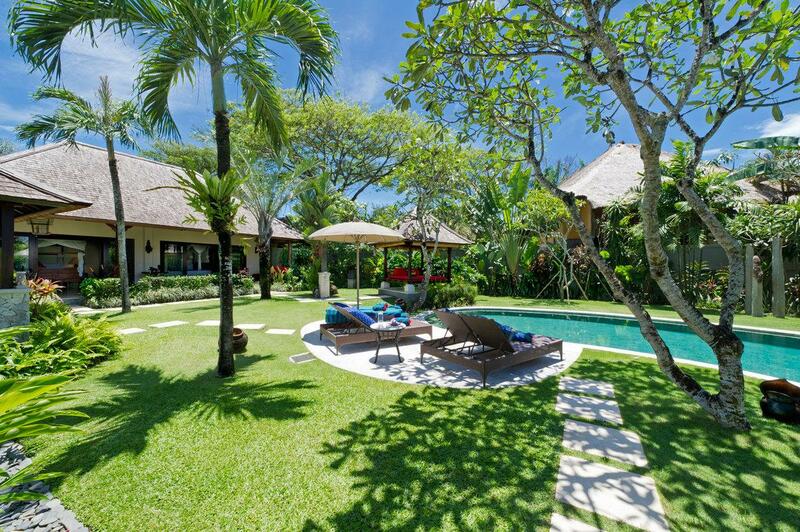 Villa Kakatua lies at the beach end of Canggu’s thriving Jalan Pantai Batu Bolong, a country lane that has experienced an amazing transformation over the last few years and is now home to some of Bali’s hippest haunts. You’ll find a number of excellent cafés, bars and restaurants within a few minutes’ walk of the villa. Among them are the chill-out beach bars, Old Mans and The Lawn, popular vegetarian venues Betelnut Café, Milk & Madu and Crate, and the ever-elegant Hotel Tugu. Batu Bolong Beach, just 100 metres from the villa, is renowned for its world-class surf breaks and rugged beauty; it’s the ideal location to catch a wave, take a stroll along the sands to nearby Echo Beach or capture the sun setting over an ornately carved sea temple.